A paddler in an inflatable kayak challenges the Dries of the New River. Photo courtesy Adventures on the Gorge. 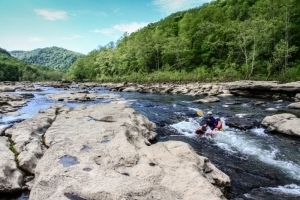 A new whitewater run that opens to commercial rafting in 2019 may not be a game changer, but it will certainly enhance the game in one of the most popular rafting destinations in the eastern U.S., says a West Virginia tourism industry official. The 5.3-mile run through a spectacular section of the New River Gorge formerly inaccessible to most tourists is ready-made for family-style trips and significantly expands offerings, says Dave Arnold, a pioneer in the tourism industry in West Virginia. A kayak drops through a chute. A former chair of the W.Va. Tourism Commission and founder of Class VI River Runners, out of which the outdoor-adventure resort Adventures on the Gorge grew, Arnold says he looks forward to seeing this beautiful section of the river opened to the public. “It really is an incredible part of the gorge,” Arnold said. The sandstone cliffs that line the rim of the gorge almost a thousand feet above the New River upstream of the New River Gorge Bridge have descended to the water’s edge along the lower gorge. Their looming presence at water level is awe-inspiring, Arnold said. Cliffs edge the river in its Dries. 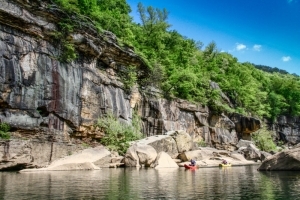 On most days, in season, Adventures on the Gorge, which is the nearest rafting outfitter to the new section, will likely run inflatable kayaks through “The Dries,” as the stretch had become known, and will run rafts when scheduled releases allow. In December the Federal Energy Regulatory Commission announced that it would provide the public access to the river below Hawks Nest Dam, which since the Great Depression had been routed out of its native channel and into a private hydroelectric plant. The measure will partly return the biome of that section of river to its pre-industrial state and open the resource to the public in some measure, according to American Whitewater, a partner in the oversight of the transition. A kayaker explores boulders in the Dries. An increase in the minimum stream flow from 100 cubic feet per second to 150 to 300 cubic feet per second, depending on the season. As a safety measure, a one-to-three day online flow-prediction service and a stream gauge to will help paddlers take advantage of the nearly 80 days annually when sufficient water supports paddling. 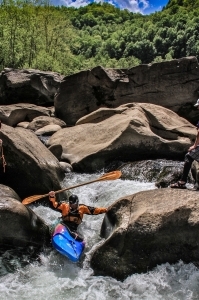 Nine new scheduled whitewater releases to be scheduled annually — two in March and seven in July and August. A river-access facility at the Cotton Hill Bridge, which will serve as the primary launch and trail-head for paddlers. A new portage trail around the Hawks Nest Dam to allow paddlers to launch upstream. A new public take-out to open below the run. 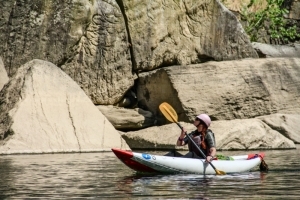 Paddlers navigate islands of sandstone. Arnold said he considers the addition of the Dries as a resource in much the same way he considers the addition of new cabins or restaurants or recreation activities such as zip-lining and entertainment venues that his resort provides — as another resource to be enjoyed and to be added like an arrow in West Virginia’s quiver. 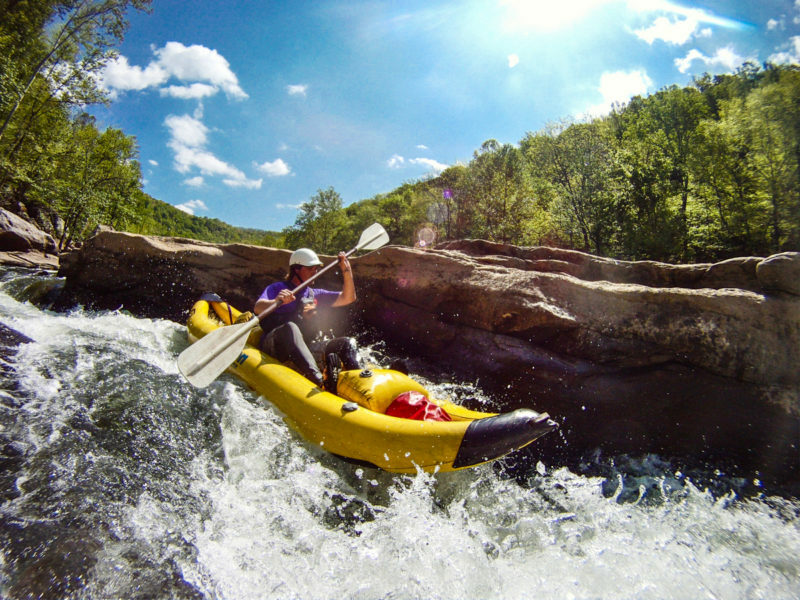 Find out more about Whitewater Rafting in W.Va.